Hello there! It's been a while since I've posted something. Another of these busy phases that keeps me from creating personal art. 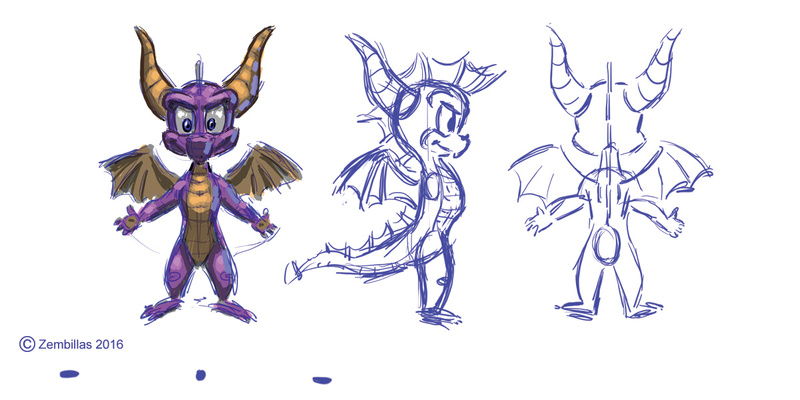 In any case I had an opportunity for a class demo last night so I chose to revive Spyro as the subject matter. I drew a 3 pose rotation in Photoshop for CG modeling. I did it very fast which is not necessarily how I like to work but time was a factor. In fact I did it so fast I had a window to pull some color into the demo. The students enjoyed it plus they learned from. For those of you who are character designers or studying character design, a CG rotation is used as reference for digital modeling purposes. In the profile view it's okay to show where the arm is connected to the body instead of actually drawing the arm. Same thing in the back view where the tail connection to the torso is shown and not the tail protruding towards the viewer. wonderful Spyro. Love to see character rotations to understand the characters structure and shapes, Hope to see more Crash art again but any ways take it easy. Thank you Cole. I haven't drawn Spyro in a long time. It was fun doing this. Great job as always, but I have one question regarding you more recent Spyro art: Why is Spyro standing up? I thought he is a quadrupedal creature with no hands. Gabriele the reason why Spyro is standing is because I originally designed him to stand at times. Also for CG modeling it's preferable to construct a character like Spyro standing and then bring him down to all fours. Thanks for the clarification, and I hope to see more Spyro art in the future! Considering that adult dragons are bipedal, Spyro probably growing to become bipedal. When I originally designed Spyro I envisioned the character as being able to rise up on his hind legs as well as stand on all fours.